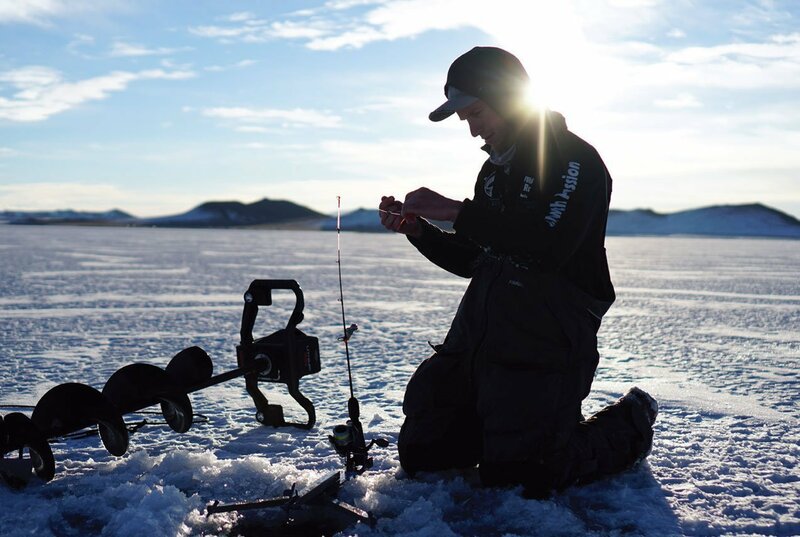 Winter angling is gaining in popularity, so we sent a newbie out for a day on a guided (and very cold) ice fishing experience. There’s something oddly thrilling about ice fishing. Aside from the survivalist pleasure of standing in the cold for hours on end, there’s an intensity to winter angling, an electric adventurousness, unmatched by the warm-weather version of the sport. I think it has something to do with standing on top of the fish. Gone are the safety and distance of the shore, the solidity of dry land. A Frisbee-sized hole and a few feet of black water—nothing more—separate you from your catch. Ice Fish Colorado runs trips to four locations throughout the state, one of which, the Antero Reservoir in South Park, has become immensely popular in recent years because of the diversity of fish species in the lake, and the high levels of scuds— small freshwater shrimp—that help them reliably grow to trophy size. 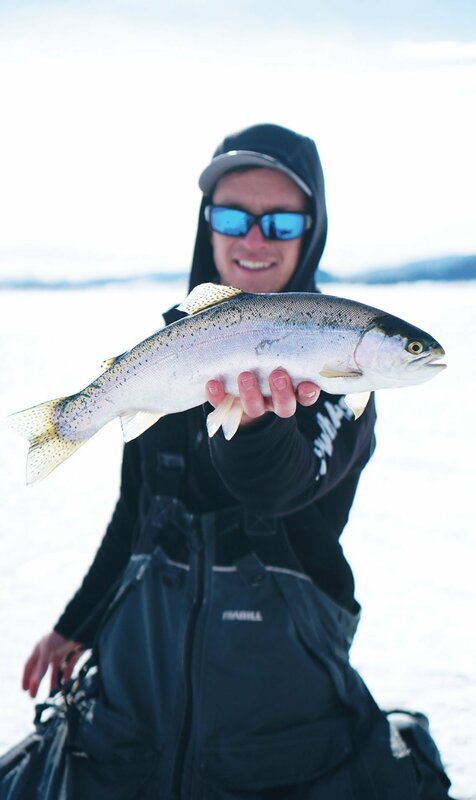 In Antero, you can find rainbow trout, brown trout, Snake River cutthroat, green back cutthroat, cutbows, kokanee salmon, brook trout, and splake. This is where Robinson and I spent our day, though you can also book Ice Fish Colorado trips to Eleven Mile Reservoir, Blue Mesa Reservoir, and the Tarryall Reservoir nearby. 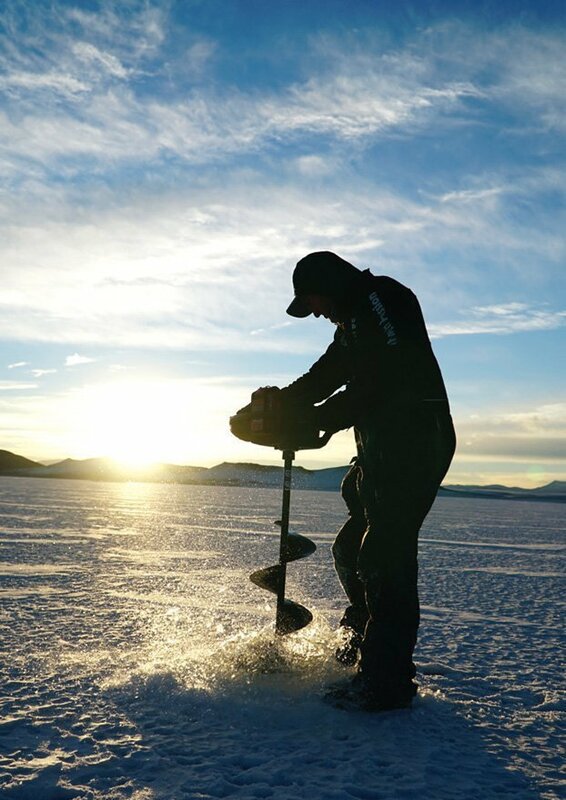 To fish on ice, you technically need only a pole and an auger for drilling holes; Richardson, however, came far more prepared. In addition to a pop-up wind tent, waterproof folding chairs, and an underwater camera, he brought a set of devices called Jaw Jackers—plastic tripods that sit over holes in the ice, with poles attached, and spring like mousetraps when a fish nibbles, flawlessly setting the hook. Richardson and I spent most of our time rigging the Jaw Jackers, waiting for them to pop, and then running over to fight fish out of the water when they did. Sitting on a silent, frozen lake with all of your attention primed for the sound of tiny bells (each Jaw Jacker has one attached, to alert you of a catch) is an experience that sharpens the mind as much as the best meditation. If you’re not careful, it can also drive you a little mad. “I hear those bells in my sleep sometimes,” Richardson told me. 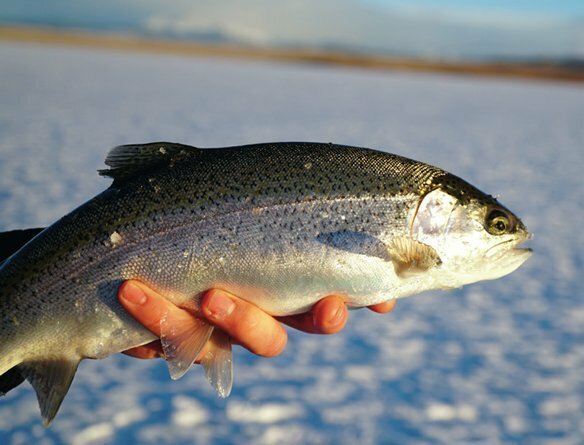 Ice fishing, like warm-weather fishing, is a sport of minute adjustments and devout patience. When we weren’t passing the minutes waiting for the Jaw Jackers to spring, much of our time was spent drilling holes and lowering the underwater camera to check depth and plant cover on the reservoir floor. Sometimes, Richardson told me, the right underwater vegetation can mean the difference between catching nothing and pulling dozens of fish out of the water. Important to note: To really enjoy the sport, it’s best to overdress. Contemplation and conversation can help alleviate the discomfort of the cold, but still, large portions of the day will be spent motionless, and after a few hours the wind can really start biting. Wear waterproof pants and gloves. You’re going to get wet pulling your fish out of the lake, and the last thing you want is damp, frozen clothing. We hooked about 20 fish over the course of eight hours, all of decent size—12 to 15 inches—but nothing huge. Richardson told me that was unusual. “You usually get at least one monster in a day,” he said, a fact confirmed by dozens of photos on Ice Fish Colorado’s website showing Richardson’s clients—men, women, and children of all ages—holding gargantuan fish, some several feet long. The daily limit at Antero Reservoir is two fish per person, but on other bodies of water, it’s more. No matter what, you’re all but guaranteed to walk away with something. Trips range from $300 (1–2 people, half day) to $500 (4 people, full day).